Use Lean Six Sigma to transform your business. Lean Six Sigma is a powerful method for improving both the efficiency and quality of projects and operations. In this new book, the team that bought you Lean Six Sigma For Dummies shows you how to take Lean Six Sigma to the next level and manage continual change in your organization. You'll learn to design a roadmap for transformation that's tailored to your business objectives; develop and implement processes that eliminate waste and variation across the company; synchronize your supply chain; and successfully deploy Lean Six Sigma over time. Define your transformation objectives and create a bespoke 'Transformation Charter' for your organization. Assess your company's readiness for transformation. Establish a 'Transformation Governance System' to help you manage the transformation programme effectively. Bring your people with you! Plan and achieve the cultural change needed to make the transformation process successful. Join up the dots between planning and effective execution with Strategy Deployment. Deploy a 'Continuous Improvement' toolkit to achieve everyday operational excellence. Sustain the transformation programme and widen the scope across the organization (including deploying to the supply chain). Adopt a 'Capability Maturity Approach' to drive business improvement – recognizing that change is a continuous transformational journey, just as pioneers like Toyota have done. Use a range of Lean Six Sigma Tools – using the right tools, at the right time (and in the right order!) enables continuous improvement by eliminating waste and process variation. Roger Burghall is Associate Partner at Catalyst Consulting and a highly experienced business consultant and change manager. Vince Grant is a Director of Catalyst Consulting and an expert in Lean Six Sigma methodologies. 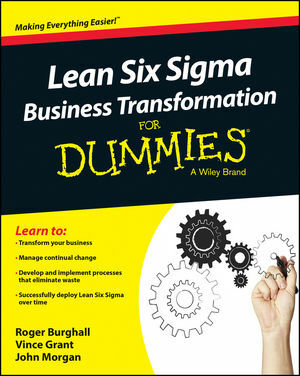 John Morgan is the author of Lean Six Sigma For Dummies.